THE SOCIALIST PARTY is mixing things up with a name change. It wants to be called “Stop the Water Tax – Socialist Party” and has applied for the change. It would mean that the anti-water charge slogan would be on ballot papers for the European elections. 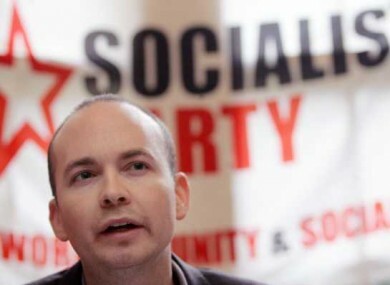 Socialist Party MEP Paul Murphy said, “We want to bring the war against austerity and the water tax into the heart of our campaign. “It also sets us up for a big non-payment campaign down the road. The idea to stop the water tax featured heavily in our campaign and it should be a key issue so we’re using it in our election campaign to build awareness. People might say that we lost on the property tax but the revenue was involved in that and they could bully it out of people. This will be a charge as opposed to a tax. Email “The Socialist Party is changing its name”. Feedback on “The Socialist Party is changing its name”.